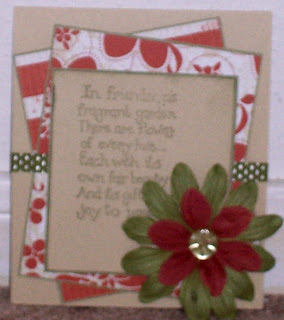 Here's another card I'll be teaching in the August 13th card class. When I saw the silhouette flowers on this pattern paper, I immediately thought of the silhouette feature on the George Cricut cartridge. I think they play nicely together. 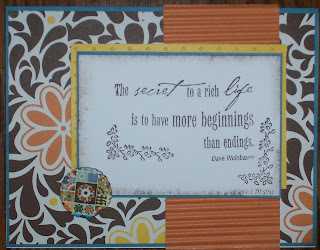 I am making some cards for the card class I'll be teaching August 13th at By Design Scrapbook Boutique. 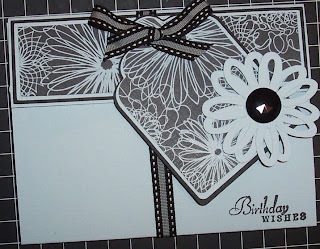 When I saw this black tulle ribbon, I began planning a card around it. I think tulle adds a certain elegance to anything. 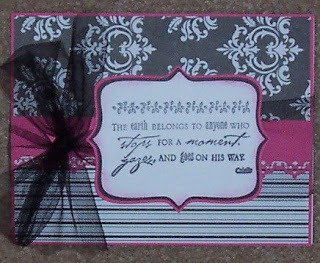 Combine tulle with black and hot pink and you've got a elegant card. I hope you enjoy this card and TFSB. When I saw this stamp, I thought to myself, how true. I also starting thinking about a card, something with soft summer colors. 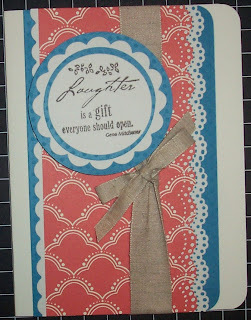 Can you tell that I'm hooked on card making: I see a stamp and think about the card possibilities. Hmmmm, might need a 12-step program. While I ponder that, I like the end results and I hope that you do. If not, don't worry. 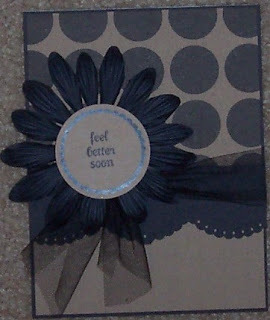 I'm sure this sweet card will take care of what ails you. I wanted to play with my ScorePad, so I adding some scoring at the bottom of the card. 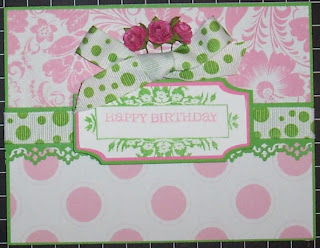 I keep telling myself that I need to make a card, without using a border punch. Well, I failed miserably on this card. It was like my arm had a mind of its own; it kept going to the drawer where I store my border punches. 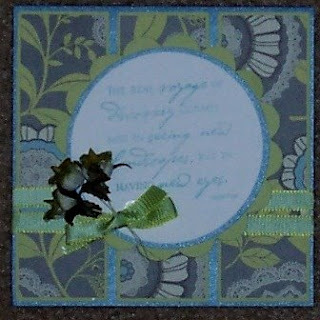 I like the way the card turned out, so I won't be too upset with myself. 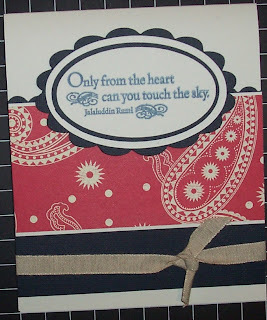 I don't generally like the western looking patterned paper, but I saw this sheet of paper and it was screaming at me to make a card with it; so, I did. The dark colored cardstock looks black, but it's actually navy blue. Doesn't this make you thing of a picnic table? Hmmm, I getting a little hungry. I was supposed to complete a few cards before I left for vacation, but with trying to get ready for that and an out-of-town family reunion, I didn't get a chance to. Needless to say, I've been burning the midnight oil since I've returned. 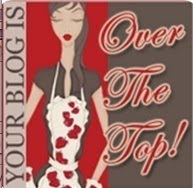 I am hoping for some scrapping time this weekemd; we'll see. But anyway, here are the cards I completed this week. 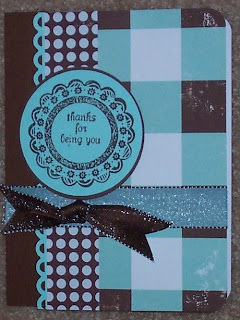 I just love this brown and Tiffany blue. I think these are my favorite colors of the summer. 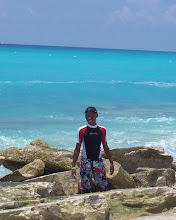 I was on vacation last week, in Cancun, with my whole family; yes that includes my mom and dad. It was easy getting dad to go, but my mother; well, that took some convincing. We had an absolutely wonderful time. I'm looking so forward to working on the layouts from trip; I took lots of great pictures and managed to be included in a few of the pictures. It's been a few weeks since I have posted anything, but I've been busy creating. 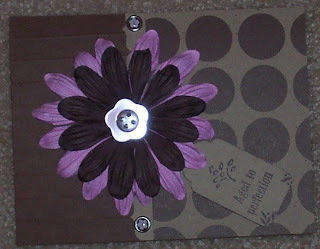 I took pictures of the other projects and I tried a different method of uploading my pictures. The new method didn't quite work for me and I lost the pictures and the cards had already been mail. 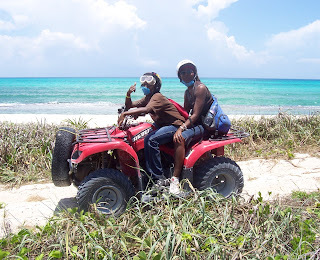 These were the only two remaining. I bought 4 sheets of very pretty paper this past weekend at Archivers and I couldn't wait to get home to play with the paper. 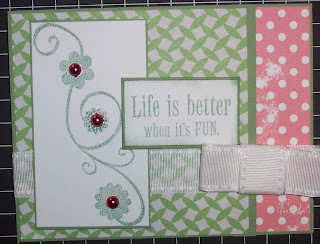 I made both of these cards from one of the double-sided sheets. I like the way they turned out. 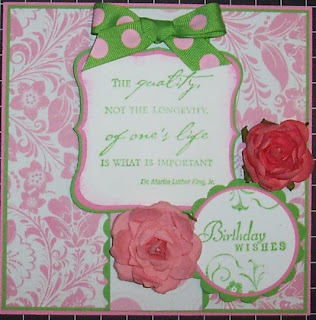 I may a little biased because pink and green are my favorite colors.